“Bumpers” battle it out during a previous Mogul Challenge, in their quest for glory and bragging rights. A sunshiny bluebird day made for soft snow, and great goggle tans! 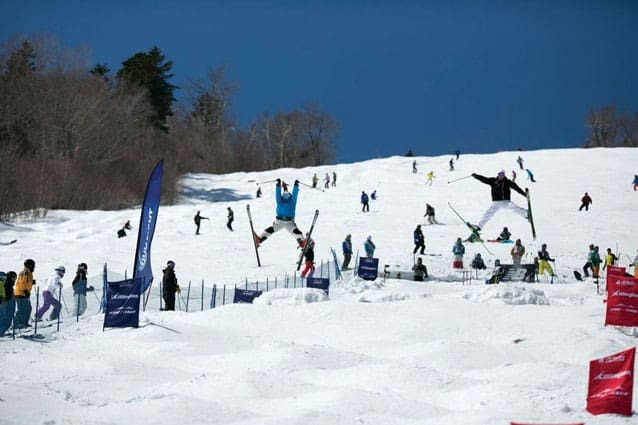 Saturday, April 11 — KILLINGTON — The highly anticipated competition and on-snow party returns to Bear Mountain on Saturday, April 11. Whether you’re an amateur bumper looking to get your name on the golden trophy or just looking to be part of the infamous Bear Mountain Mogul Challenge scene, this is definitely an event not to be missed. The Beast loves to let loose as much as the next guy, but respect gets respect and they’ve got some tips to make sure the day is fun for everyone involved. Pre-registration is sold out! All pre-registered competitors must check-in at the third floor of Bear Mountain Lodge between 7 – 8:30 a.m. on Saturday. If you are not checked in by 8:30 a.m. your spot will be given to someone on the waiting list – so don’t be late! A waiting list will start the day of the event at 7 a.m. at the registration desk for all non-registered competitors. At 8:45 a.m., there will be a drawing for unclaimed bibs. You must be present to enter your name and at the drawing to win a spot in the event. This is an amateur event; no current or within the past five years USSA competitors are allowed to compete in this event. Each competitor must wear a properly fastened snow sports helmet during all event practice, course inspection and competition. Know your limits (skill and ability levels) and stay within them. This isn’t the time to try something you’ve never done before. The Start Order party for qualifiers will be held and determined at Sushi Yoshi on Friday, April 10, 8-10 p.m. Qualifiers includes one run for each competitor, running 9 a.m.-12 p.m. The overall top 32 men and 16 women will move on to the finals (1-4 p.m.), a dual format with the winner of each dual advancing to the next round until a winner is crowned. Awards are presented to first through fourth place overall male and female competitors, who will also get their names engraved on the Bear Mountain Mogul Challenge trophy. Any men or women who qualify for finals will be entered to win a week-long trip to Momentum Ski Camp! The drawing for this grand prize will be held at the Pickle Barrel Night Club during the After Party from 8 p.m. – 2 a.m. on Saturday, April 11. Turns and line, 60 percent. Quality and variety of well-executed turns while staying as close as possible to the fall line. Air, 20 percent. Quality of upright aerial maneuvers executed spontaneously in the fall line. Inverts are strictly prohibited. Speed, 20 percent. Speed score will be based on a male and female pacesetter’s time. The purpose of the Mogul Challenge is to recognize technical superiority and athletic ability.